Hey there! Holy I am cutting it close to wishing my lovely friends Courtney and Brethil the happiest of birthdays. But, if it counts for anything, I had a drink after work for you guys for your birthday instead of writing my blog post (bad blogger!). To celebrate their birthdays they have chosen a very unique inspiration photo. I don't think I've ever seen one with such different results. It's fun! Keep on reading to see their photo choice. Hey there! 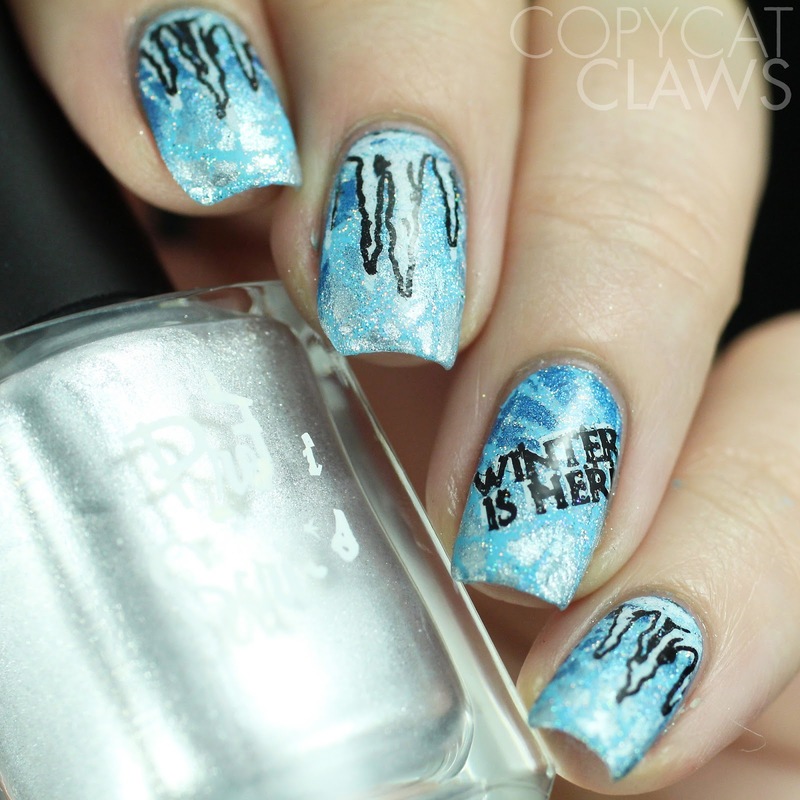 This week's Nail Crazies Unite theme is Winter Animals. At first I wanted to go with something cutesy like penguins or polar bears but honestly, around here, the animals I see the most in winter are crows and magpies. I love birds and these birds are smart but so darn annoying. 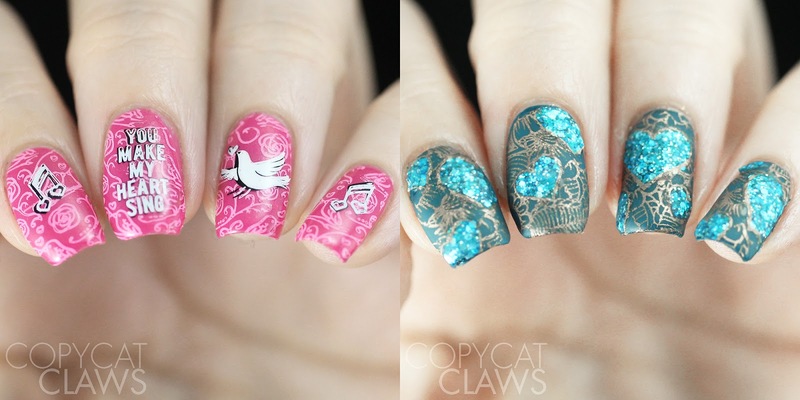 Despite their squawking, I thought they should get their moment in the nail spotlight. 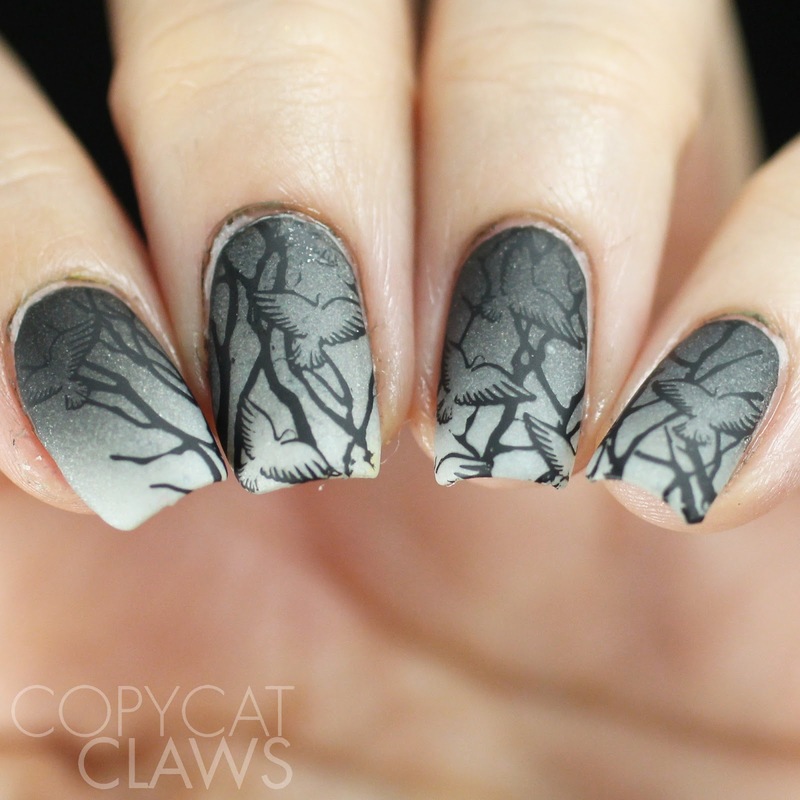 The stamping image ended up looking more like doves but I swear, big dark birds was my intent. Hey there! I wanted to post a quick reminder about the UberChic Beauty Giveaway that I'm having for Collection 23 and Love & Marriage 04. It'll close in a few hours so get in while you can (it's at the bottom of last week's post which can be found here). 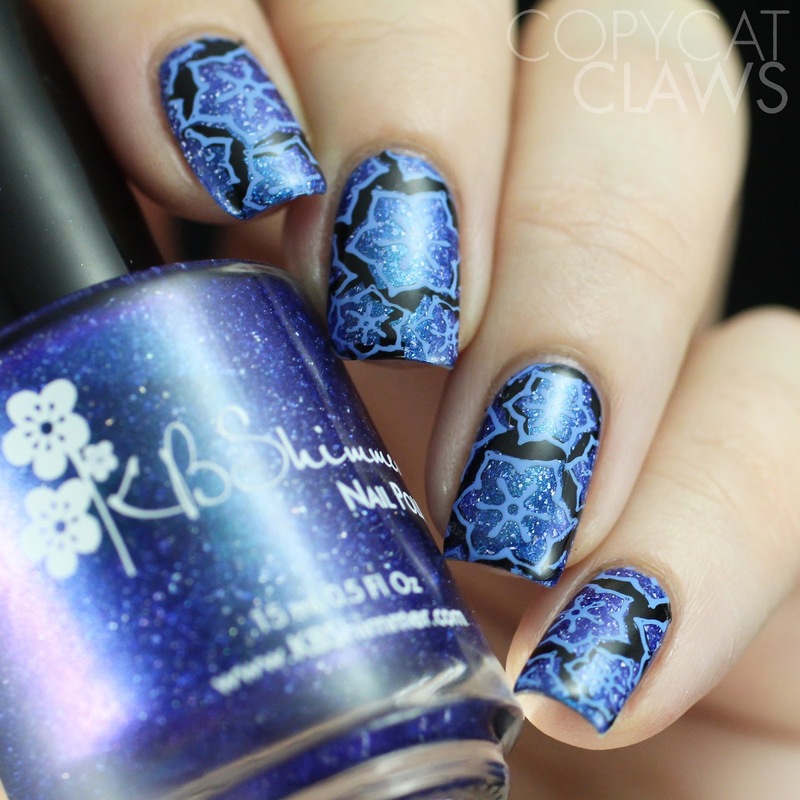 I liked this collection enough that I did another mani with it last week with KBShimmer's Why So Sirius, a polish that I absolutely fell in love with which I also reviewed last week. I honestly kept thinking about it so I thought I should put it on again, with some UberChic stamping for this month's Nail Challenge Collaborative prompt of "blue". Hey there! Today's post is definitely one of my flashiest manis ever, though sadly it was a short-lived one. 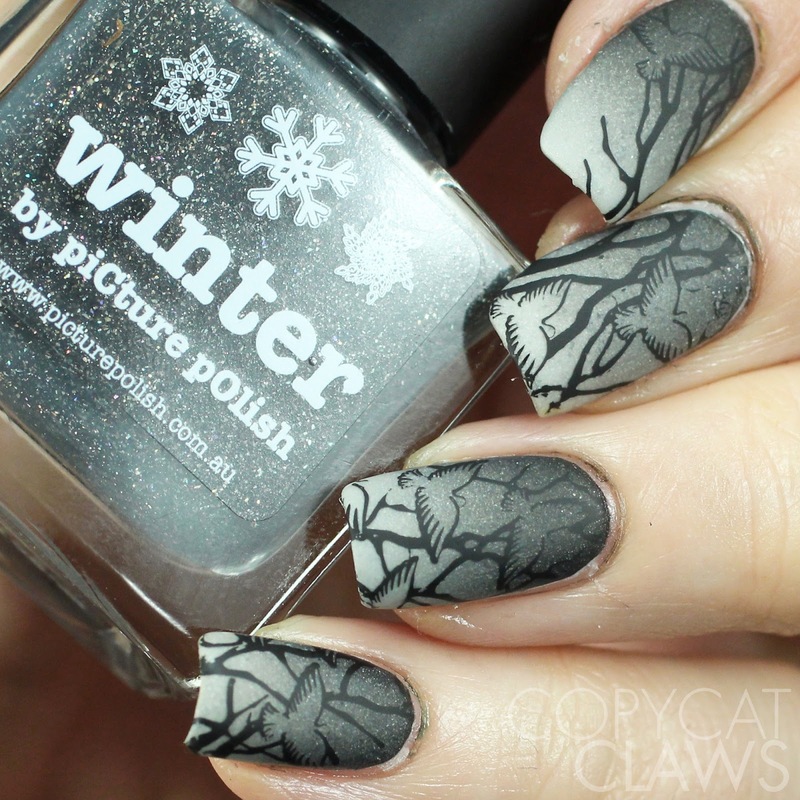 I did this prompt for 26 Great Nail Art Ideas over Christmas holidays. I had friends in town so I couldn't see them with plain nails. So I spent an afternoon creating this blingy design, only to practically ruin it on my way to see my friends by finding the large charm WAY too fun to play with. It spins! I don't normally think I'm a fidgety person but I couldn't resist spinning the charms from the second I got them on my fingers. I just need to find a better way to make them stay. Hey there! The holidays might be over but the Holo-Days never are. 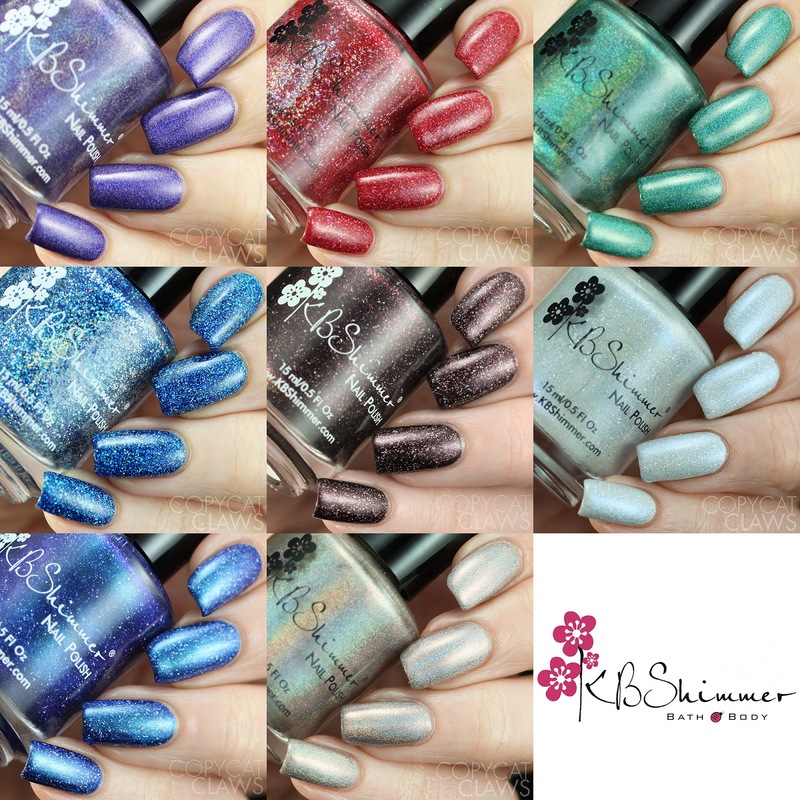 Last month KBShimmer released their 8 piece Holiday 2017 collection, aptly name Holo-Day. I'm always such a fangirl of KBShimmer polishes, especially the cremes, but this collection shows why I shouldn't get stuck in a creme rut. 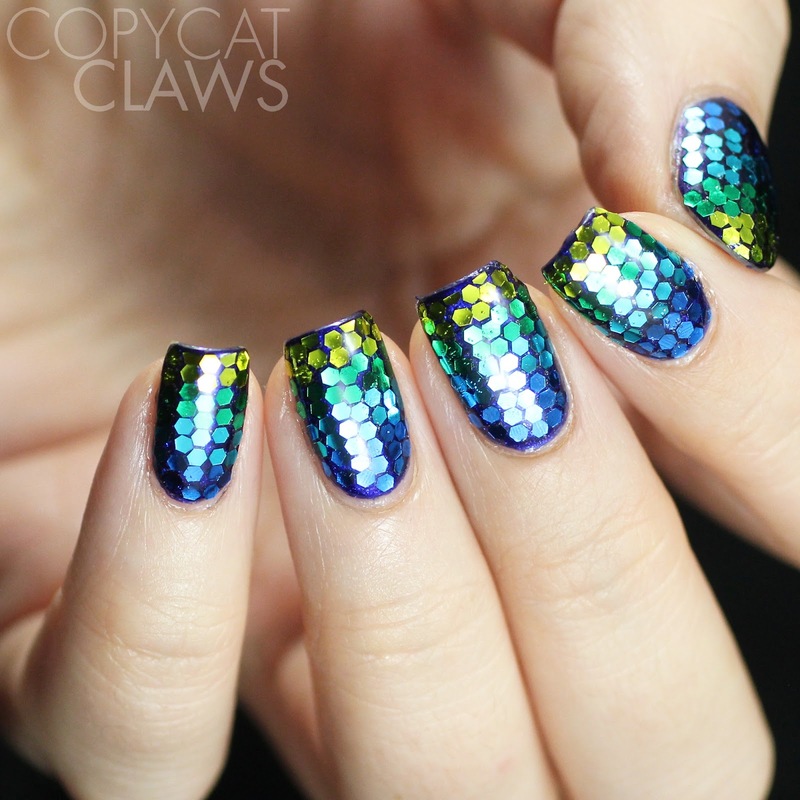 Their holos are gorgeous too. I especially love the variety of finishes that they have to choose from. In addition to linear holographic polishes, there are also Mega-Flame glitters and, my personal favourites, Holo Glow Flakes (scattered holo flakies in a shimmer base that really does give it a "glow" appearance). Who knew you could do holographic in so many ways?! 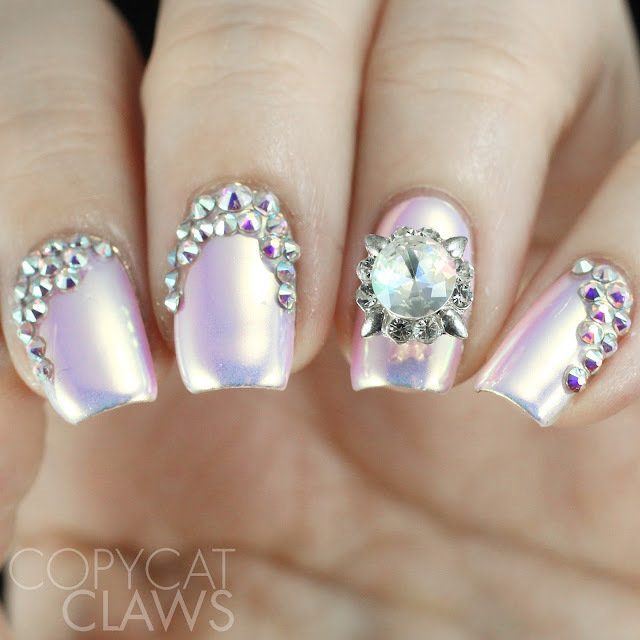 I was lucky enough to receive these from Color4Nails, an US-based stockist, to review. In case you haven't visited them in awhile, Color4Nails just got a website facelift and it is looking STELLAR. Give them a visit if you haven't checked it out already. UberChic Beauty Collection 23 and Love & Marriage 04 Review including GIVEAWAY! Hey there! Let me start off by saying today's post includes a giveaway! Did that get your attention? 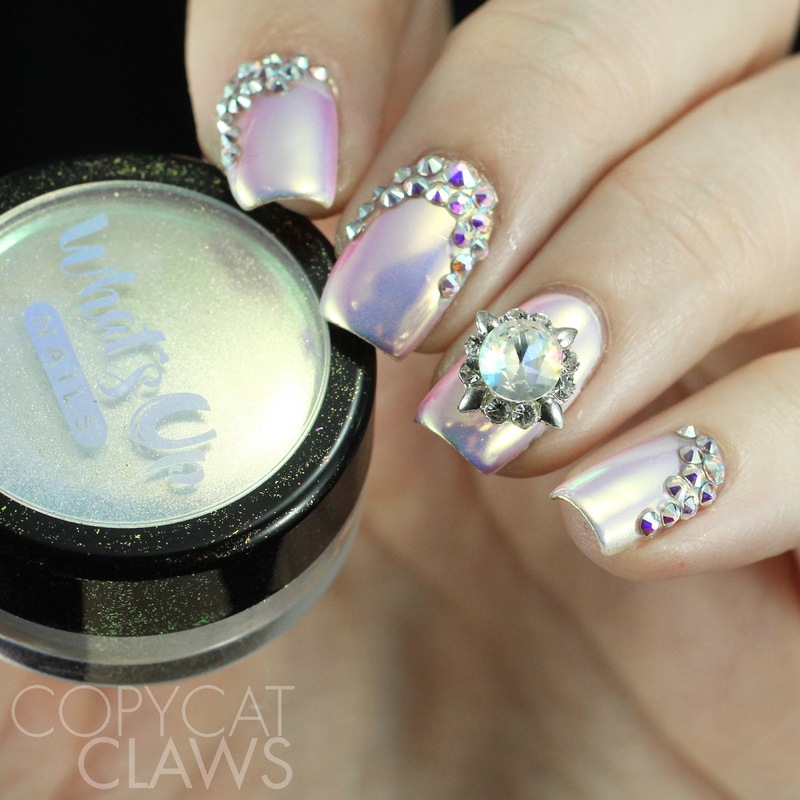 I was sent UberChic Beauty's Collection 23 and Love & Marriage 04 plate to review and a little mix up resulted in me receiving two of each...possibly because Brittany was just days away from her first baby (congratulations Brittany!!). So Brittany's pregnancy brain is good for you guys since there's a giveaway for the extra plates at the end of this post. I hope the new man in her life lets her keep designing plates because these latest ones are awesome! They're really everything I love about UberChic plates. 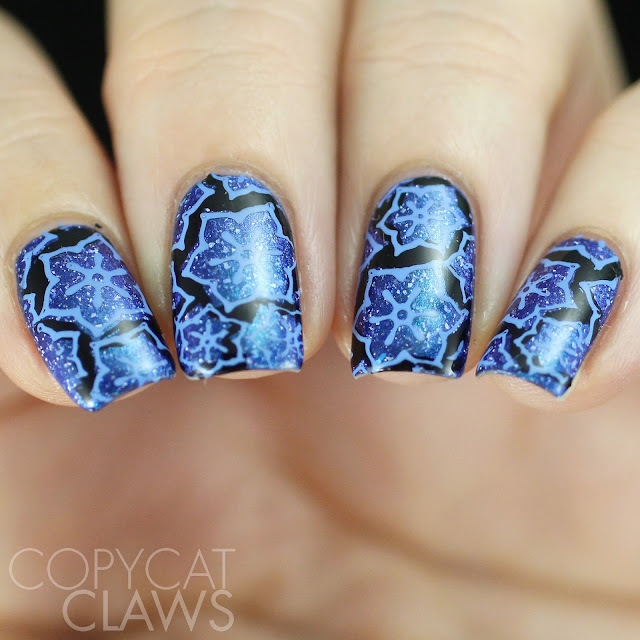 The images are big enough for most people (17 x 21 mm) but designed so most of them work for those of us with smaller nails, the etching is wonderful and there's such a fun mix. I really like the layered image options in these plates, even if I'm still not great at actually lining them up. 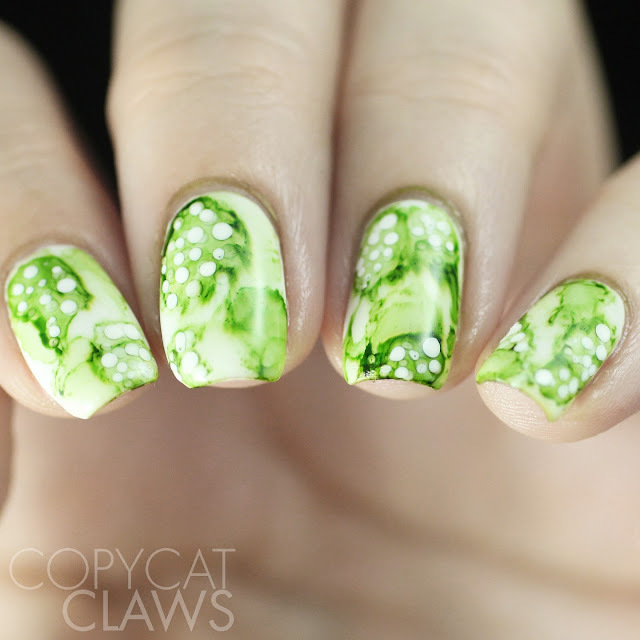 Keep reading to see all the details for my manis and to get to the Rafflecopter to enter to win the plates for yourself. Hey there! 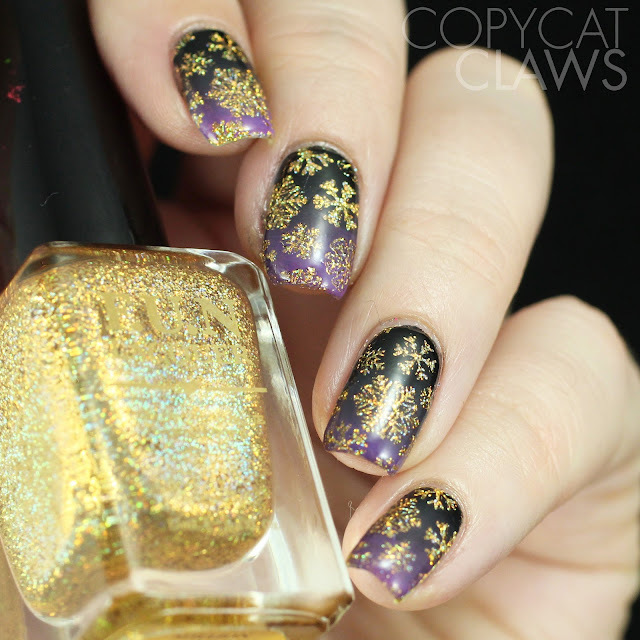 My final mani for The Digit-al Dozen's All That Glitters week is combined with this week's Nail Crazies Unite prompt of Gold Snowflakes. 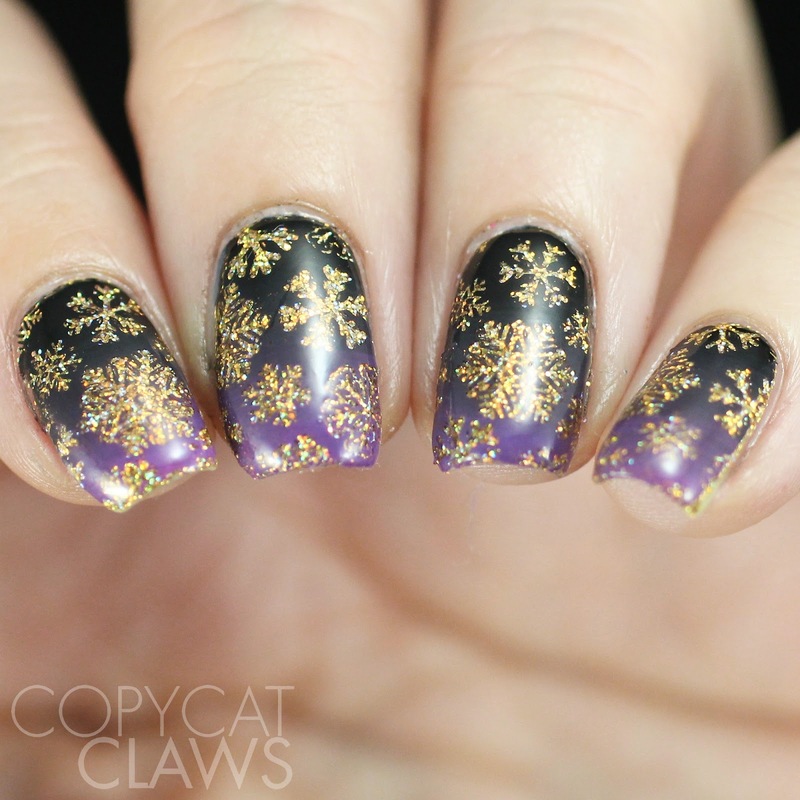 That one is pretty specific so it made it easy to figure out how to combine them - gold glitter with negative space snowflakes. Easy peasy! I love when I can combine prompts. I have already done my DD manis for next month and I can't wait to show you the combined prompt for that Friday. 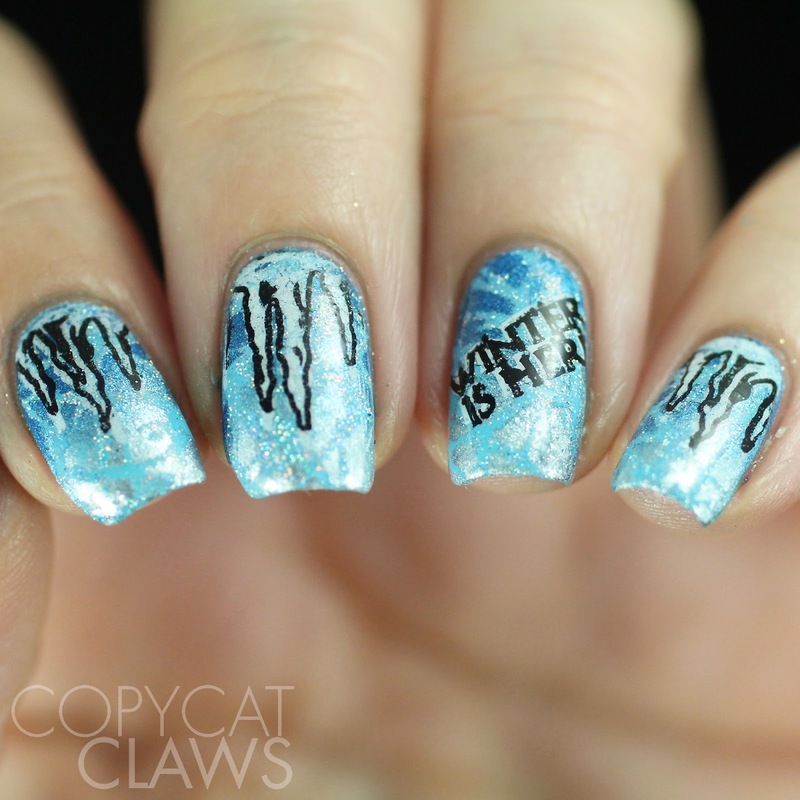 It's one of my favourite manis in awhile. But for now, we have sparkly snowflakes. It's my second wintery design this week but I make no apologies. We've been in a deepfreeze here. Actually, a freezer is approximately -20 C but with windchill it's felt like between -30 and -40 here so it's worse than a freezer. Can you tell I'm so done with winter already? Hey there! For today's glitter-y Digit-al Dozen post I used a stamping image that turned out to be very popular this week. 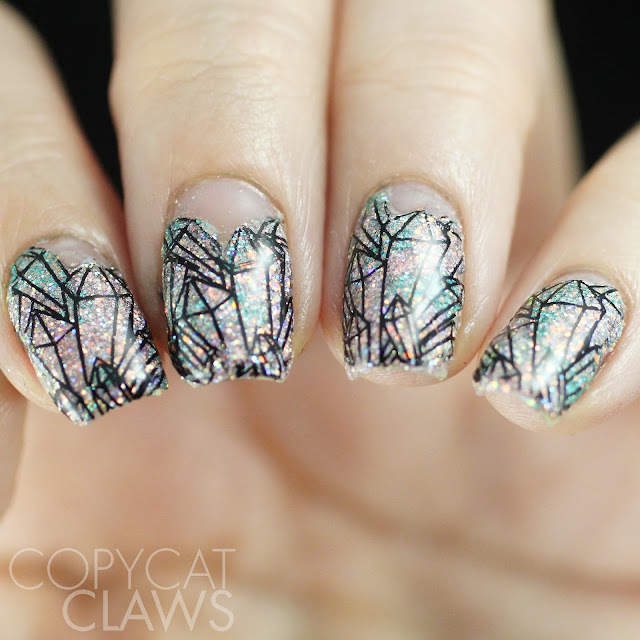 That doesn't surprise me at all - this crystal image is super cool AND crystals are glittery all on their own, even if you don't actually use glitter polish. Hey there! Oh I know, I'm SO late for today's post. But I had an anxiety-riddled day so I needed to come home and chill before getting to my blog responsibilities. So now that my brain is in a much calmer state, I'm here! For today's Digit-al Dozen All That Glitters post, I did a form of nail art that I have tackled a few times and always have a love-hate relationship with it. I love how it looks but I hate how long it takes. Yup, it's glitter placement. Taking one tiny piece of glitter at a time and placing it in a somewhat organized fashion doesn't really fly with my impatience. But it sure can look swell!! Hey there! 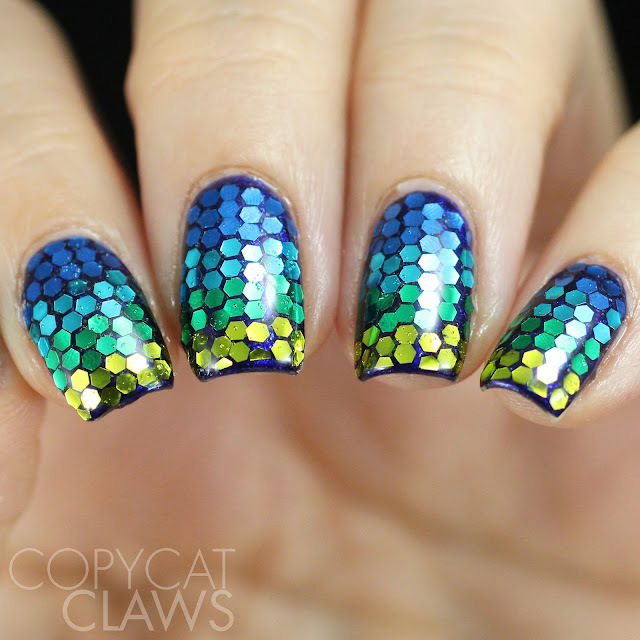 The nail art I have for you today is for Day 2 of The Digit-al Dozen's All That Glitters week AND Nail Challenge Collaborative's Blue theme. It really couldn't be any more appropriate given the weather my city is having right now (lots of cold and wind and snow...feels like -31 C with the windchill. It also fit the weather when I did them over the holiday break which felt more like -40 which is the same in Celsius and Fahrenheit. For anyone who has never experienced -40 degrees, it is very clearly winter. How much longer until summer?? Hey there! It's a new Digit-al Dozen month. And today we officially welcome a bunch of new members. 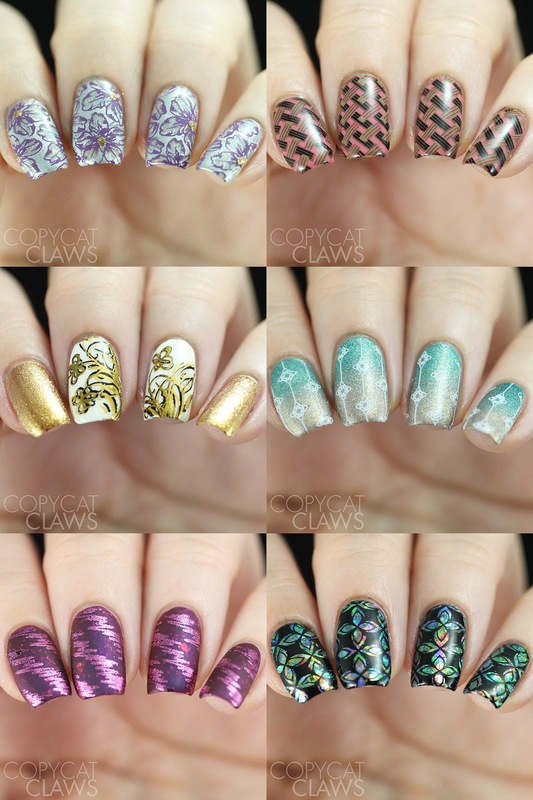 Michelle from Lacquer or Leave Her started her DD time last month and this month Tiffany from Polish and Paws, Kim from Kimett Kolor, Oksana from The Polished Koi, Brethil from Druid Nails, Courtney from Polished Lifting and Kirsty from Fairytale Nails join us for our "All The Glitters" theme so I hope you can give them some love. It's even Brethil's 40th birthday today so she deserves all the love you can shower on her! 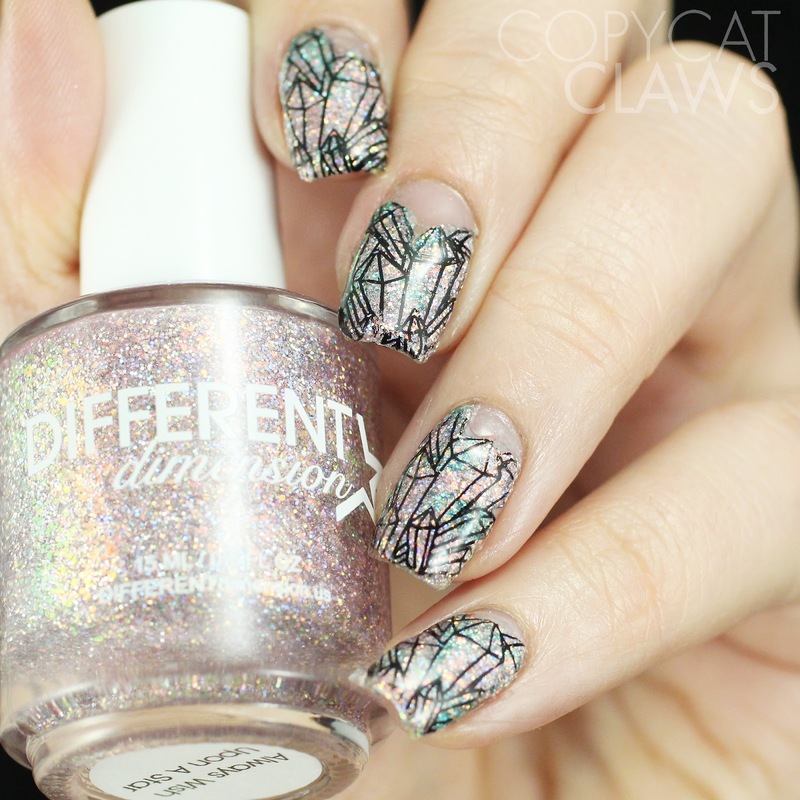 I did this glitter-y mani over the holiday break with some Whats Up Nails Peppermint Candy stencils. But I was tired of holiday nails so I went with a summer collection for something bright and fun! Hey there! I guess this is my first post of 2018...so Happy New Year! It appears I've started off my year by being a lazy blogger and not posting for a week but I did spend a lot of my holidays doing my nails so I should have lots of posts coming up. 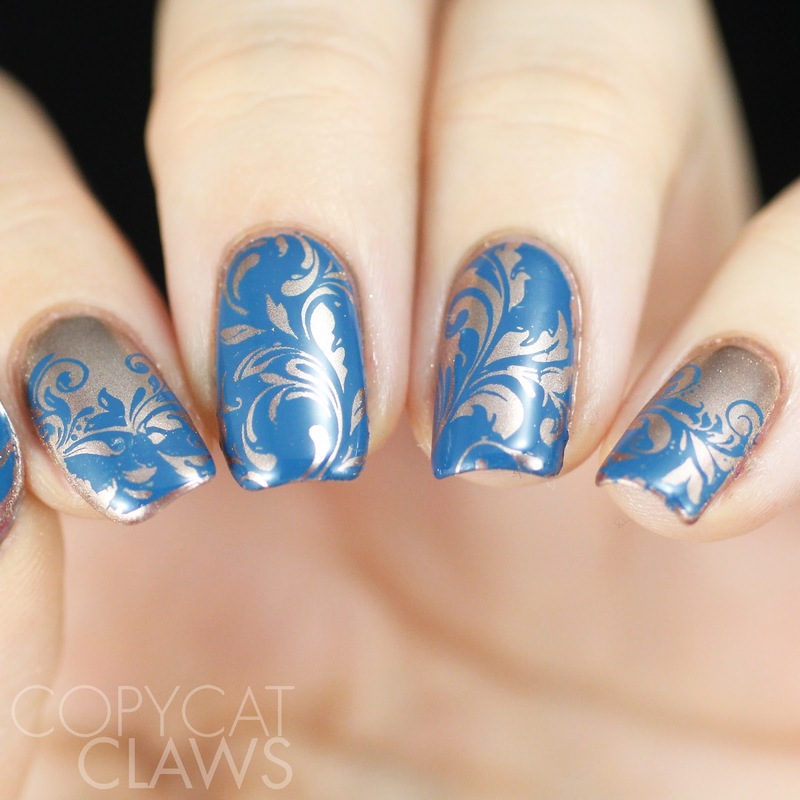 For the first post of the year, I have this week's 26 Great Nail Art Ideas theme - Metallic + One Color. That makes for a nice, easy prompt. 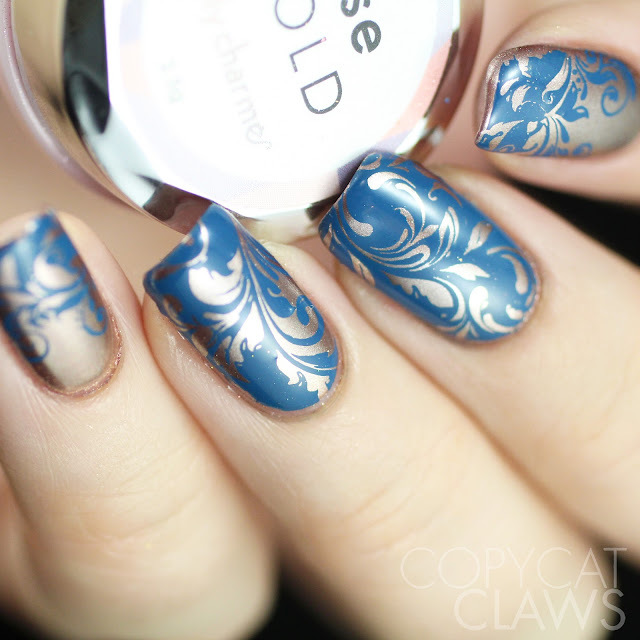 I paired up some colored stamping over some rose gold chrome nails for my instalment. Hope you like it!